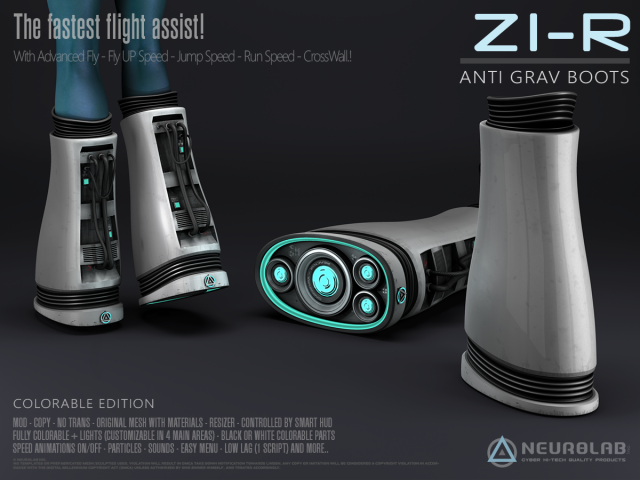 Neurolab is proud to present to you the new Z1-R AntiGrav Boots (Color-able). A Unique Look! EXCLUSIVE Flight assist, NO LIMIT! Speed Enhancer (Up to130 Meters Sec). The Z1-R are supplied with a HUD customization “Smart Hud,” which allows you to customize 4 different zones with an infinite number of combinations. Customize everything! Create an infinite number of unique color combinations to match your style. ◦ Alpha layers and Foot shapes (optional). 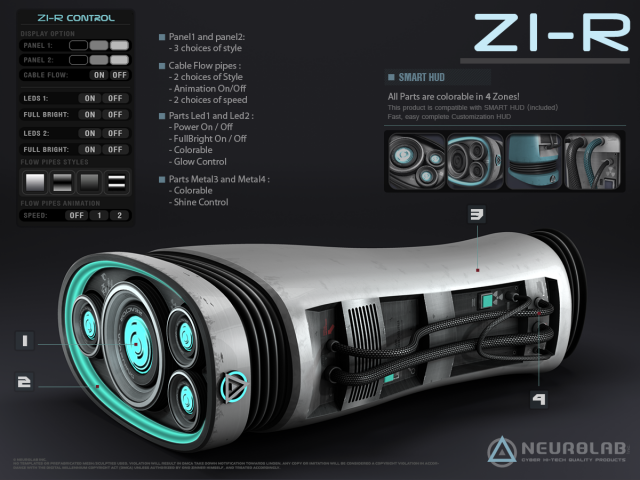 – Wear the Smart HUD, Click to “HUD CUSTOM” button to the boot menu to connect product and customize..
V1.0: the new Product is remade from scratch. It is not an update of the previous product (Z1 Sculpt) but a remake. We do not offer updates on remakes. -100% Script Engine Rewrite to IMPROVED MEMORY SCRIPTS ! … and A lot a new features!